The Piri Reis map is an old world map drawn in 1513 by the Ottoman admiral and cartographer Piri Reis. Unfortunately only part of the map which is nearly one third of the original survived. It’s unbelievable but this historic map depicts the western coasts of Europe and North Africa, as well as the coast of Brazil pretty accurately. A number of Atlantic islands, such as the Azores and Canary Islands, along with the mythical island of Antillia, are also depicted. This exclusive and rare artifact is of great historical importance as it vividly demonstrates how far the New World was explored by the Europeans by 1510. 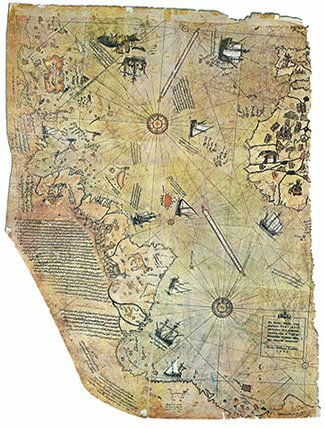 In addition, the Piri Reis map is believed to have used Columbus’s maps that were lost, as a source. Ottoman Sultan Selim I received this map as a gift in 1517. It is considered to be based on ten Arab sources and four Indian maps sourced from the Portuguese, as well as one map by Columbus. The Piri Reis map was discovered accidentally in1929 by the German theologian Gustav Adolf Deissmann (1866–1937). The Turkish Ministry of Education got him to make a catalogue of non-Islamic artifacts stored at the Topkapı Palace library. Deissmann came across some material, which he thought might be a unique find, so he showed it to the orientalist Paul Kahle, who identified it as the Piri Reis map. The discovery of the historic map became an international sensation, as it was the only copy of a world map of Christopher Columbus known at that time. It was also the only map compiled in the 16th century that had proper longitudinal position of South America in relation to Africa. For several centuries scientists in vain had searched for a so called “lost map of Columbus” that is thought to have been drawn during his voyage to the West Indies. After the discovery of the Piri Reis map the U.S. initiated an investigation to find the Columbus source map, which was supposedly in Turkey as well. Unfortunately, the investigation failed to find any source maps. Currently the Piri Reis map is housed in the Library of the Topkapı Palace in Istanbul, Turkey, but is rarely displayed to the public. The Piri Reis map was depicted on the reverse of two banknotes: on the Turkish 10 million lira banknote of 1999-2005 and on the 10 lira banknote of 2005-2009. The map is a portolan chart, with lines of bearing radiating from the four compass roses. The most recent map analysis conducted by Steven Dutch of the University of Wisconsin Green Bay reveals that the map is centered at a point near the intersection of the present-day prime meridian and the equator. The surviving fragment of the map features extensive notes in Ottoman Turkish near the edges, along with some inaccurate interior detail. The Piri Reis map had long been considered the most accurate chart of that time. However, a thorough analysis of some other portolan-style maps of the era revealed that the Piri Reis map is not the most accurate map of the sixteenth century. There were a number of other world maps drawn the same century that significantly excel it in accuracy, such as the Ribeiro maps of the 1520s and 1530s, the Ortelius map of 1570, and the Wright-Molyneux map of 1599, to name just a few.